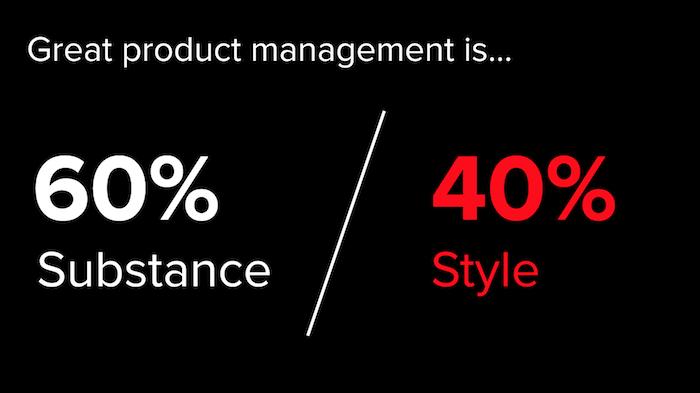 Unfortunately many product managers often aren't spending enough time on style. The symptoms of this can be non-obvious. When I hear product managers tell me that their hard work and great ideas aren't being appreciated, it often comes down to style. When they say too many cooks in the kitchen is hindering their process instead of improving it, it's another symptom of lack of style. Or when feeling that they live in a consensus-driven organization and decision-making is painfully slow, it's often related to lack of style. So how can product managers learn to improve their style? I've found that the highest leveraged opportunity is to learn the fine art of being compelling. So many of the soft skills associated with product management come down to convincing others of your ideas. Whether it's convincing an engineering or design colleague of a trade-off, negotiating with a peer product manager, excelling at a product review, getting your project green lit, or convincing early adopters to try your product, all of these boil down to making a compelling argument to the stakeholders involved. Crafting a compelling argument is a function of the substance of the argument, the style of the argument, and the target audience. Obviously the content and merit of your argument are important. But that's probably where you are spending most of your time already. Equally important is thinking deeply about the style of the argument you're going to use. And it's important to consider the style with respect to the target audience, or key stakeholders you are trying to convince. Since everyone processes information differently, you'll want to adjust your style based on what is likely to be most persuasive to those key stakeholders, which you'll ideally determine by consulting with peers, managers, and others that have prior experience working with the decision makers. Let's now drill into what I like to call the elements of style of a compelling argument. 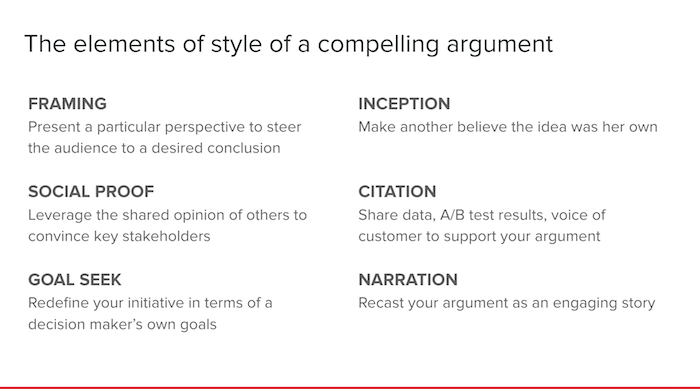 I'll go through six styles here, but keep in mind this is just a shortlist of some of the most effective styles I've leveraged but there are dozens of more ways to make a compelling argument. Present a particular perspective to steer the audience to a desired conclusion. The best way to understand framing is via photography. We've all seen that beautifully composed photo that gets you to focus on what otherwise would have been a rather mundane aspect of the broader scene by carefully positioning the area of interest in the photo. The photographer has thereby framed the photo to draw our eyes and attention to the particular perspective they'd like us to have. That's exactly the idea behind framing and applies equally well to making a compelling argument. When making an argument, you have the opportunity to frame what your audience sees in your argument and thus set the tone for the conversation and discussion. Here's an example: Let's say you've found that most of the product work your team does is fairly incremental and you feel that your team should be taking bigger swings to really stretch and accomplish something great. But there has been pushback in the past that such ideas are too risky and usually get rejected. Knowing that this is likely to be an issue, you can re-frame risk as ambition in your argument. Talk about how you want the team to be far more ambitious than they have been in the past and to take bigger swings. Don't ignore the risk, but embrace it. Talk about how you are managing the risk but that risk is necessary to really do anything ambitious, which is of course something we should all strive for. Leverage the shared opinion of others to convince key stakeholders. As product managers we do this all the time for our product, including customer testimonials, press mentions, and more on our marketing site to drive social proof and encourage adoption. The same principle applies equally well to making a compelling argument. While you may not have the credibility yet established with key decision makers you need to convince, others may. For example, let's say there is a peer in your organization that you know has the trust and ear of a key executive you need to convince. Getting them onboard with your argument prior to the exec meeting and sharing that with the decision maker allows you to leverage the trust and credibility that your peer has already garnered for your own initiative. Collective wisdom is another form of social proof. Let's say for example you're trying to convince the team to implement a feature and you can point to others in the industry that have taken a similar approach, you're effectively saying all these smart companies are aligned with you in their thinking, so it might be worth considering. Redefine your initiative in terms of a decision maker's own goals. I love the goal seek function in Excel because it allows you to work backwards to the required input to get at your desired goal. That's exactly how you want to reposition your argument. The key decision maker likely has a set of goals they are focused on at the moment. And when you can reposition your initiative as a derived initiative created to help them reach their own state goal, it becomes a far more convincing and enticing initiative for the decision maker to approve. Make another believe the idea was her own. Inspired by the beautiful movie, the idea is to attempt to plant the seed of the idea organically in the mind's of the key stakeholders themselves. Sometimes decisions get stalled due to egos. Don't let your ego get in the way. Instead find ways to work with the key stakeholders to make the idea their own. Involve them early in the process. Ask pointed questions in a brainstorming session that steer them to your same conclusion. Whatever it takes to get them to articulate the idea as their own, greasing the wheels for approval. Share data, A/B test results, voice of customer to support your argument. First party research is always a compelling way to make an argument. The key here is to summarize the most salient points to succinctly make your argument, as simply surfacing lots of data becomes dilutive to your cause. So think hard about what data is going to be the most convincing for the key stakeholders. Are they intensely data-oriented? Or are actual customer stories far more likely to convince them? Recast your argument as an engaging story. Story telling is one of the most effective tools for making an argument. But we rarely rely on it due to how difficult and time consuming it is to craft a relevant narrative. The biggest takeaway here is simply that taking the time to brainstorm possible narratives is often worth it given it's efficacy when you can pull it off. Let's stay you are trying to convince your team to invest in polish around a few features, I've found sharing broken promise stories of actual customers experiences that were derailed by the lack of polish far more compelling than a series of JIRA tickets to get them motivated and onboard with tackling the required bug fixes, redesigns, corner-cases, and more. Next time you find yourself trying to convince a stakeholder of your idea, make sure you spend nearly as much time on the style of your argument as the substance of the argument itself, as you'll find unlocking the skill of being compelling can significantly accelerate your success as a product manager.